Afer you have paid for your session, contact us to schedule your appointment. Seasonal and Promotional Specials Available. Be sure to ask! All packages must be paid in full upon order date. Additional discounts do not apply. All sessions in program purchased are to be completed within one month of purchase. Potpourri may be changed weekly with prior notice. 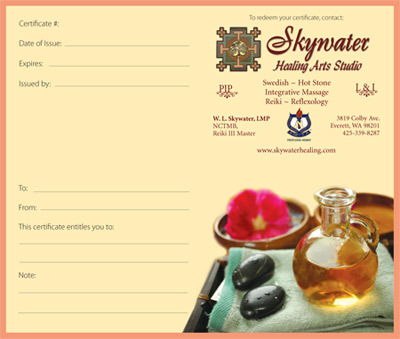 Purchase a gift certificate through Paypal in any amount, and we will send you our gorgeous certificate by mail.